On the weekends, when we don’t get our standard muffin-and-coffee breakfast at the local coffee shop, I sometimes make hard-boiled eggs. Only, I don’t boil them. I’m not sure where I saw it (Good Eats, perhaps), but a TV-chef recommended steaming the eggs rather than boiling. That method has worked great for us, so here’s how I do it. Add about an inch of water to your steamer pot. We use a 12-inch diameter pot and a serendipitously sized colander that fits nicely in the top, leaving about 3 inches for water below the basket. Bring the water to a boil and reduce the heat a bit to keep it a gentle boil. Put all of your eggs in one basket. (Rather, gently place your eggs in the steamer basket). 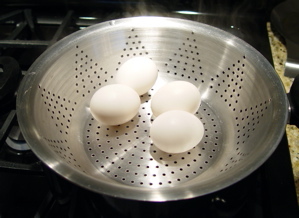 Put the basket in the pot and cover, allowing the eggs to steam for 12 minutes. Remove the eggs once they’re done cooking and place in a bowl of ice-water to cool them down for safer handling. Tap the eggs repeated on the counter to crack the shells and peel. Cut them up with a fork, add salt and pepper to taste, and serve.